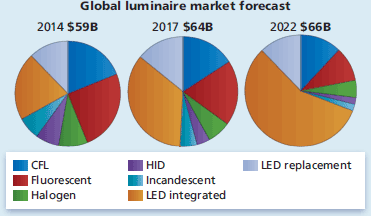 The worldwide LED market grew 9.8% to $12.5 billion in 2011, with 44% growth in the lighting sector, according to Strategies Unlimited, who revealed the top-ten LED suppliers for the year. However, the outlook remains roughly flat for the next 5 years, peaking in 2013. 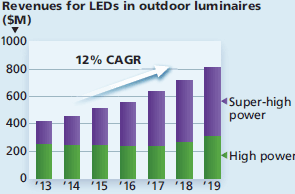 The worldwide high-brightness LED market grew from $11.3 billion in 2010 to $12.5 billion in 2011, a growth rate of 9.8%, according to market-research firm Strategies Unlimited. Demand for LED components (i.e. 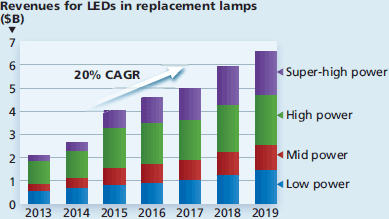 packaged LEDs) in the lighting market grew 44%, from $1.2 billion to $1.8 billion. 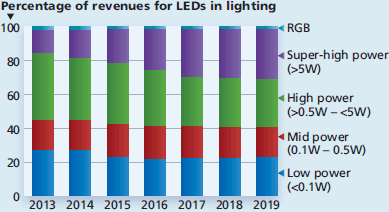 However, looking ahead, the annual revenues for packaged LEDs are likely to stay approximately flat for the next five years. 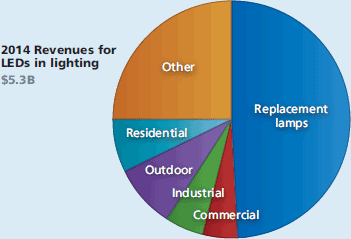 The growth in revenue from the lighting sector will be largely offset by a decline in the backlighting sector. The latest HB-LED market update was revealed during a pre-conference Investor Forum at the Strategies in Light event in Santa Clara. Analyst Ella Shum of Strategies Unlimited will go into more detail on HB-LED market developments in the keynote session of the conference on Wednesday February 8. 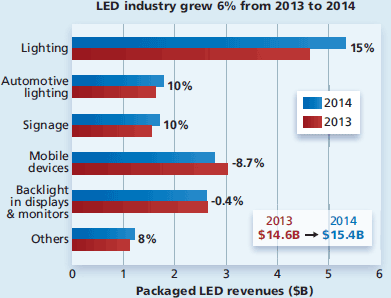 On the supply side, 10 companies accounted for more than 68% of the LED market in 2011. Strategies Unlimited arrived at these figures after analyzing market demand as well as the supply-side activity of 54 LED component suppliers. (*Companies have the same ranking when the difference in revenue is within the margin of error. Revenue includes packaged LED sales only, so pure-play LED chip companies such as Epistar are excluded). Geographically, Taiwanese and Chinese suppliers gained market share at the expense of the other regions. China’s improvement in product quality, coupled with gains in the domestic market, fueled the growth from 2% market share to 6% in one year. Korean companies lost share in the slowing market, even though they were the most aggressive in increasing capacity during the ramp-up in 2010. The expansion by Philips Lumileds, Cree and Osram Opto into 6-inch substrates slowed as there was a great deal of excess capacity in their existing 4-inch lines. The Japanese LED business has trended down or flat. However, Nichia and TG are major beneficiaries of the boom in tablet computers. Osram Opto gained a major design win, which propelled its visible LED component business to more than $1 billion. Mobile - This segment stayed flat in 2011, at $3.4 billion. The overall decrease in the mobile phones market was offset by a sharp rise in tablet display and flash applications. A major development in this segment is the move to OLED displays. Approximately 50% of smartphone displays are expected to be OLEDs by 2016. 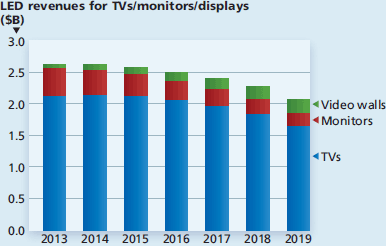 TV/Monitor backlights - The LED revenue for TV and monitor backlights was $3 billion in 2011, but it is projected to drop substantially by 2016. The key disruptive factor in this segment is the introduction of low-cost, direct-backlit technology, targeted at sub-42-inch LCD TVs. This new technology can result in significant savings in the bill of materials (BOM), reducing the gap between LED- and CCFL-backlit TVs. These TVs are known as “chubby TVs” since they are thicker than the slim edge-lit design the industry has been touting for the past few years. 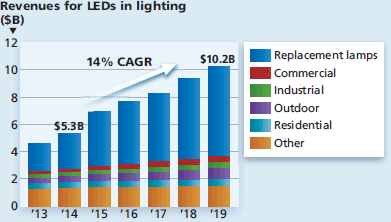 Lighting - The same supply conditions that reduced the price of LEDs increased the demand for packaged LEDs in lighting applications from $1.2 billion in 2010 to $1.8 billion in 2011. System efficacy, rather than LED efficacy, was the gating factor in 2011. 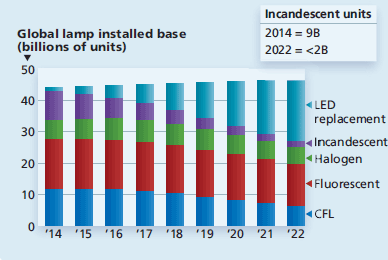 The LED luminaire and replacment lamp market was $9.3 billion in 2011, an increase of 45% over 2010. The market for LEDs in lighting is expected to demonstate substantial unit growth over the next five years, but revenue growth will be much lower due to pricing pressure. 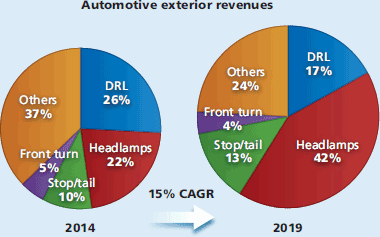 Automotive - Revenue reached $1 billion in 2011 We expect a 5-year CAGR of 34% for LED headlamps. In addition to the styling issues, this is part of the trend to convert all front lighting to LEDs, as it will provide more front-end room for the car designer and reduce the overall system cost. Revenue for interior automotive lighting will show a modest decline over the next five years as instrument panel adoption reaches saturation and the market declines with prices. 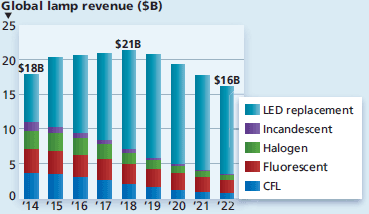 Future growth - The revenues for the LED packaging industry are expected to be flat in the next five years. With excess capacity in the industry there is a threat of unsustainable prices. Consolidation – both vertical and horizontal – can help improve margins. To further improve profit margin, product strategies such as LED packages tested for high temperature, narrow binning, high CRI, directional /multidirectional LEDs, and embedded controls are being tried by the market. Strategies Unlimited has reported 69% year-on-year growth in total sales of LED lamps and luminaires, and expects further growth in the next few years for LED lighting products and LED components for lighting. 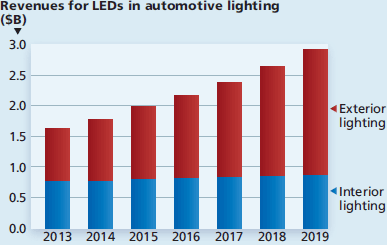 Despite a decline in the overall market for lighting products in 2011, the LED lighting market (including both LED lamps and LED luminaires) had an exceptionally good year in 2011, growing by 69% year-on-year. 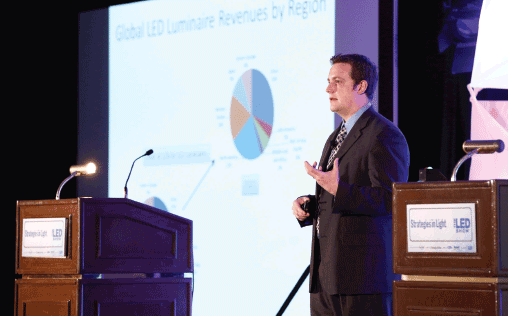 Vrinda Bhandarkar, Director of Research for LED Lighting with market-research firm Strategies Unlimited, said that the total revenue from the LED lighting market was $5.5 billion in 2010 and $9.4 billion in 2011. The results were presented during the Solid State Lighting Investor Forum at Strategies in Light 2012, which opened today. Moreover, the LED lighting market is predicted to grow at a compound annual growth rate (CAGR) of 20% from 2011 to 2016. Commercial and industrial lighting was the biggest growth sector. Bhandarkar said that almost 23 million LED-based downlights were sold worldwide during 2011. 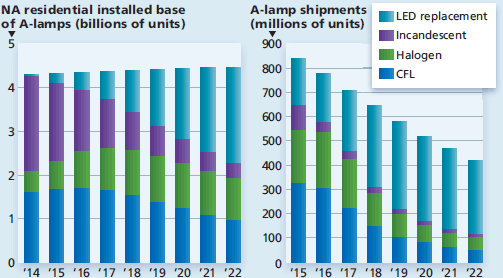 Compared with previous forecasts, the growth in sales of LED lamps has been scaled back, since the products are still expensive and alternatives are available. However, sales of LED luminaires of many types were higher than previously expected. Bhandarkar said that users are beginning to appreciate the benefits of LED lighting, beyond light output. She said. 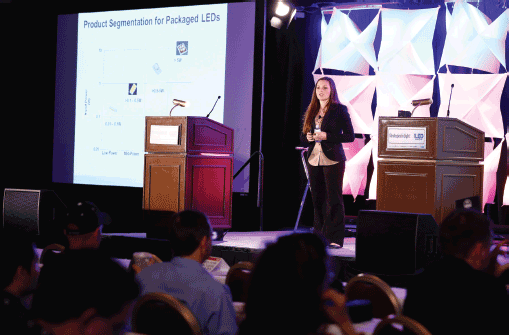 The total market for LED packages used in lighting applications reached $1.8 billion in 2011, up from $1.2 billion in 2010, and is expected to grow at a CAGR of 13% from 2011 to 2016, when it will reach $3.3 billion, according to Ella Shum, Director of LED Research with Strategies Unlimited. 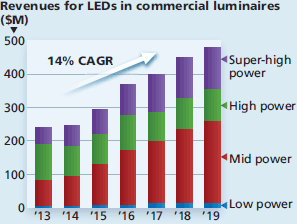 The revenue growth for LED components (13%) is less than for LED lighting products (20%) because the average number of LEDs per lamp or luminaire will decrease, and LED pricing will continue to fall. The growth in LEDs for the lighting sector will help to offset the decline in LED revenue from backlighting (which includes LED backlights for TVs and monitors) and mobile sectors (the latter includes notebooks and tablets). 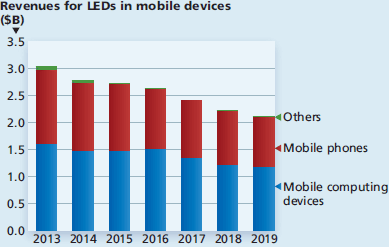 Overall, said Shum, the total market for packaged LEDs will grow from $12.5 billion in 2011 to $13.3 billion in 2012. It will stay roughly flat in 2013 and then decline slowly (see chart). The overall CAGR from 2011 to 2016 is forecasted to be -0.2%.